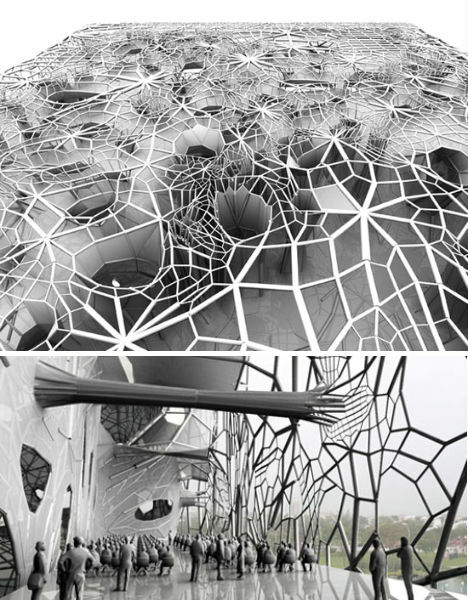 How can architecture autonomously grow and expand when it is not constructed with living materials? 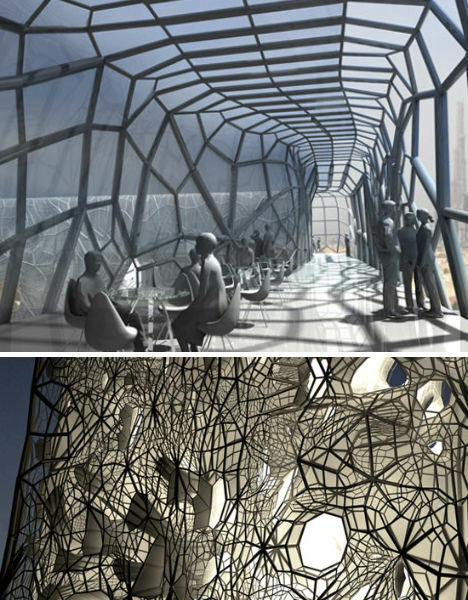 It almost sounds like a nonsensical riddle, but such a thing might actually be possible if Faulders Studio ever gets a chance to build its ‘GEOtube Building‘, a concept for Dubai that features a self-built exoskeleton made from accumulated sea salt deposits. 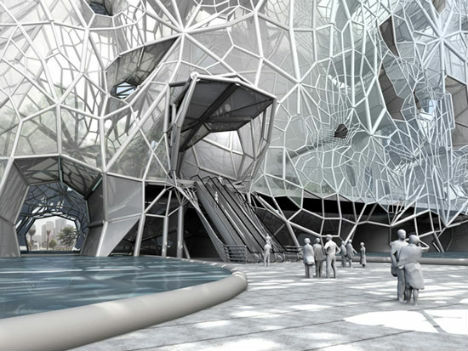 The GEOtube building is covered in a vascular pipe system following a grid of structural lattice and is situated in a salt-water pond, carried to the building from the adjacent Persian Gulf via an underground viaduct. 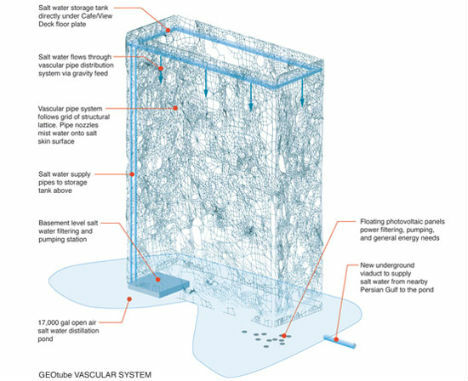 Utilizing floating solar panels for power, the seawater is pumped from basement level to the rooftop and is then gravity-fed through the vascular system. The lace-like skin forms once the seawater, misted onto its exposed mesh, evaporates and leaves a layer of salt behind. Because the Persian Gulf has the world’s highest salinity for oceanic water, the salt deposits accumulate quickly, making the transparent skin take on a new crystalline appearance. Faulders Studio imagines that after 15-30 years, the salt accumulation would make the skin nearly opaque. At this ‘mature stage’, sea salt could be harvested for commercial use. It’s a visually stimulating, sculptural, ever-evolving approach to architecture, tailored to a specific location, and would certainly add yet another weirdly wonderful building to Dubai’s growing collection.